As I already told you all in my granola post last week, this year marks my second attempt at trying to cook my way through my favorite cookbook. Last year I made it through almost all ten “February” recipes, and I’m not sure how I didn’t make this banana bread recipe as soon as possible, because I love banana bread. And zucchini bread, and coconut bread, and really any loaf-type bread that I can kind of pretend is healthy but that’s really an afternoon (or breakfast!) treat. I’ve been really into this recipe lately, and getting really confident (aggressive) with swapping oat flour, brown rice flour, almond meal, wheat germ, flax seed meal, etc. for the white flour – it’s kind of amazing because no matter how much scarily-healthy stuff I dump in, it still turns out delicious every time. I also love this one from the Sprouted Kitchen Cookbook (since I really can’t get enough coconut). 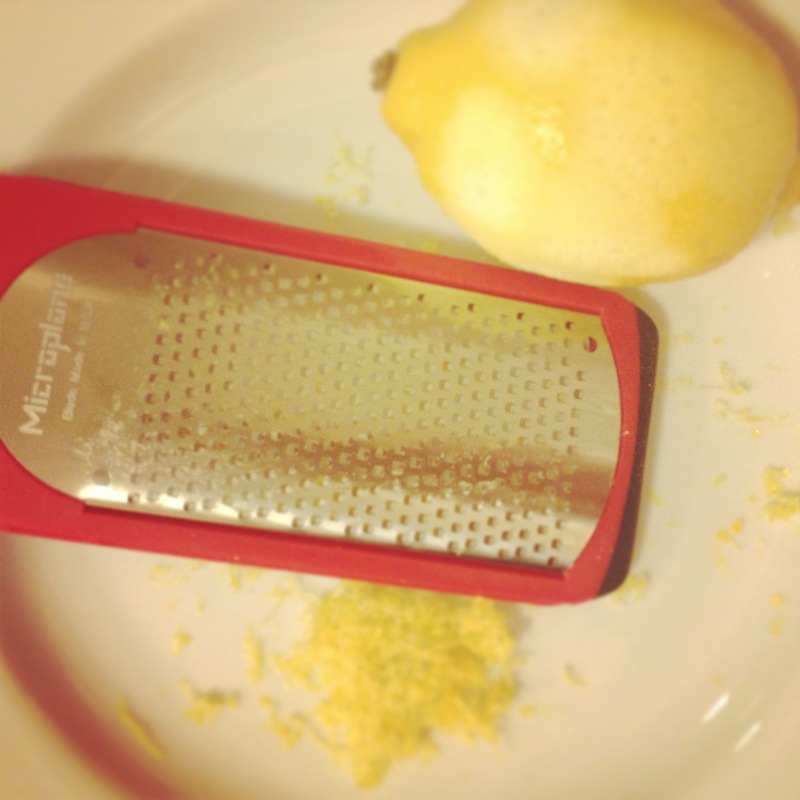 This one is next on my list – lemon or grapefruit, I can’t decide. It’s clearly a cake, though, so I probably can’t rationalize making both. Melissa’s recipe is definitely on the sweeter side, but since it’s made with olive oil, brown sugar and whole wheat flour, we still get to pretend it’s quasi-healthy. Minus the chocolate chips and frosting, which you could easily omit (and/or use nuts instead of chocolate, if you’d prefer). The lemon is pretty subtle (especially without the glaze), but it still lends a fresh and slightly tart flavor to the bread. For purposes of this blog post, I followed her recipe exactly, but I’m pretty sure you could easily use whole wheat flour/oat flour/rice flour/almond meal/etc. in place of some or all of the white flour – it just might make for a denser cake bread. If you’re not worried about white flour, or butter, or sugar, etc., there are a million recipes out there that can meet your needs – I’ve been dying to try this one (which, interestingly enough, has lemon in it too!). But if you want to dip your toe into the waters of baking with white flour substitutes and olive oil, this recipe is a good way to do so. I promise you’ll never miss the butter! 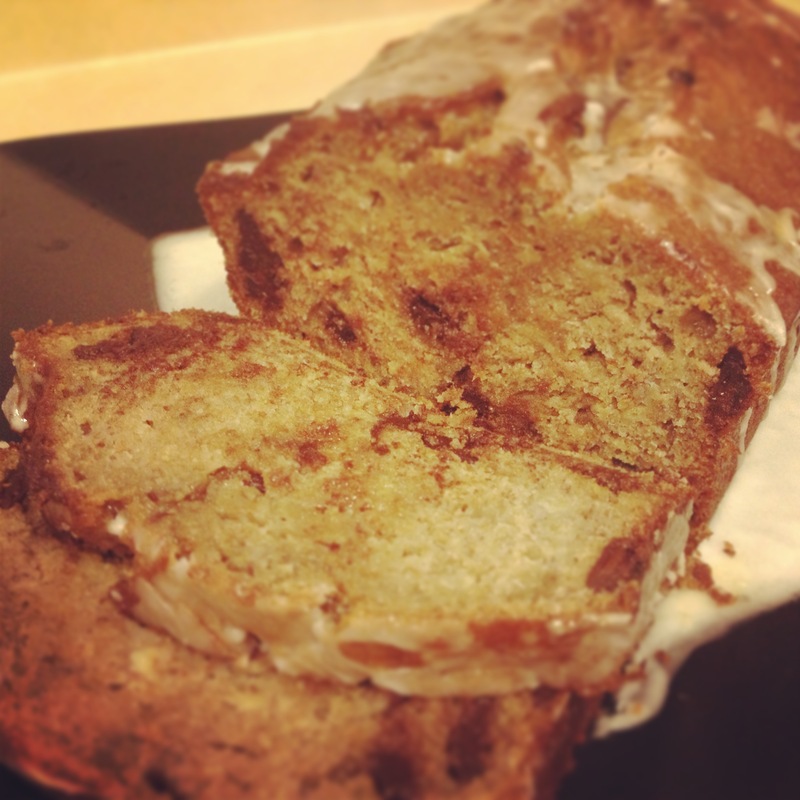 If anyone has a favorite banana bread recipe, I would love to hear it! Or any tips for using my new obsession, almond meal ($3.99 for a huge bag of it at Trader Joe’s – if you take anything away from reading this, let it be that) . Now that bathing suit season is approaching, I’ve got to start using it to bread chicken instead of in cakes and cookies, I’m afraid, but it’s so delicious I almost don’t mind. 1. Preheat oven to 350 degrees F. Grease a 9×5-inch loaf pan. 2. In a large bowl, whisk together the flours, brown sugar, baking soda and salt. Add the chocolate pieces and combine well. 3. 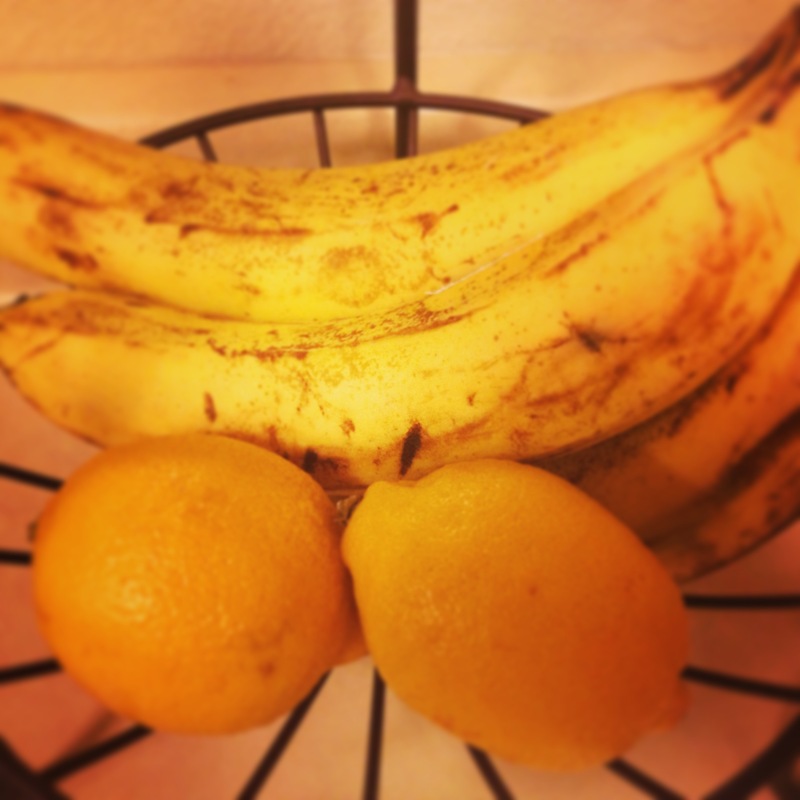 In a separate bowl, mix together the olive oil, eggs, mashed bananas, sour cream or yogurt, lemon zest, and vanilla. 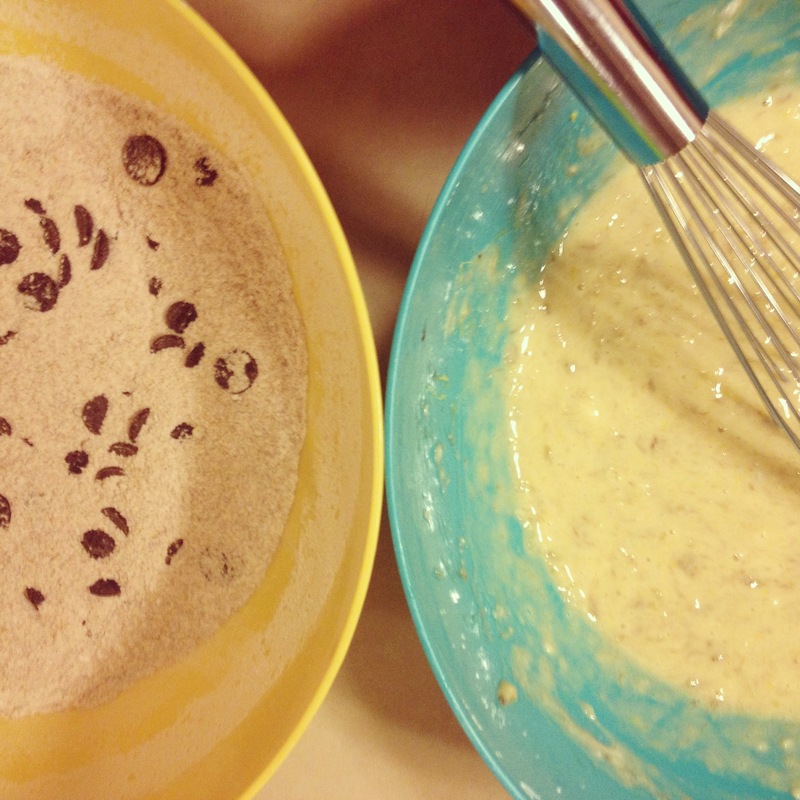 Pour the banana mixture into the flour mixture and fold with a spatula until just combined. Scrape the batter into the prepared pan and bake until dark golden brown and a tester inserted into the middle of the loaf comes out clean, 50 minutes to one hour (note: mine took probably an extra 10-15 minutes). 4. Transfer the pan to a wire rack over a rimmed baking sheet to cool in the pan for 10 minutes, then turn the loaf out of the pan to cool completely. 5. While the cake is almost cool, prepare the glaze. In a small bowl, whisk together the confectioners’ sugar and lemon juice until smooth. Drizzle the glaze on top of the cake, spreading with a spatula to cover. 6. Tell yourself this is totally appropriate to eat for breakfast. 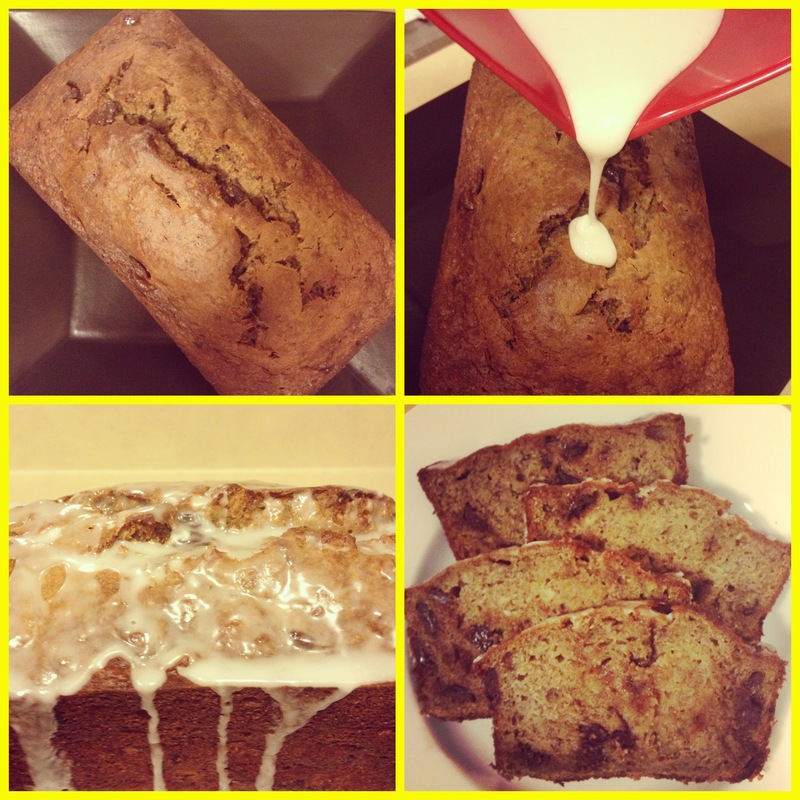 It is banana bread, after all! I bought the almond meal today based on your suggestion! I like the idea of olive oil rather than butter!!! Why does that not surprise me? 🙂 Good luck with the almond meal chicken! “…and getting really confident (aggressive)” -LOL! Love the idea of using olive oil!!! I’ll have to give this a try! Right? Or coconut oil – then if we could only figure out what to sub for the sour cream/yogurt (applesauce?) it could be dairy free!